As we saw in a quick pictorial article added at the end of last week day one of the event saw 40 and 765 joined by Sunderland 16 and Blackpool 31 to operate the service before Friday 12th April saw another four tram service made-up of 31, 40, 765 and Newcastle 114. 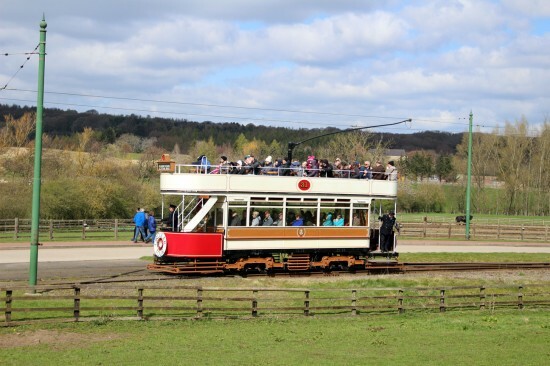 Day three – Saturday 13th April – was a very busy day at the museum which necessitated a five tram service with 40 and 765 operating alongside residents 16, 31 and 114. The event then came to a conclusion on Sunday 14th April with Oporto 196 making its first appearance of the event alongside 16, 31, 40 and 114– Manchester 765 was seen stabled outside the depot having suffered a minor fault in the morning. Throughout the weekend Sheffield 264, Grimsby and Immingham 26 and Oporto C65 were all clearly visible inside the shed. 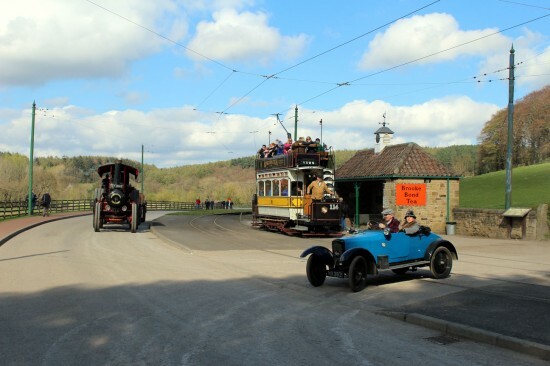 As always with events of this kind at Beamish all trams ran around the clockwise circuit which does mean that the chances of seeing trams pass in opposite directions are not possible. 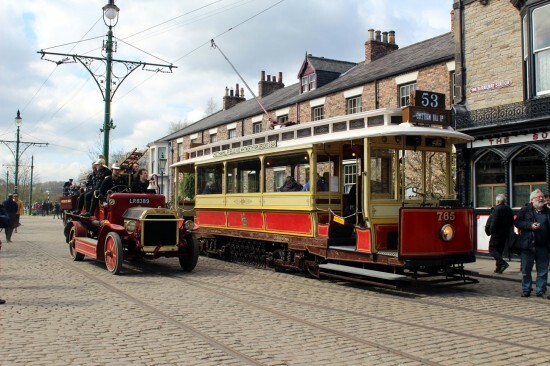 However, this is made up by the huge variety of other transport you can capture images of alongside the trams – making Beamish pretty unique with some of the photo opportunities you do get. 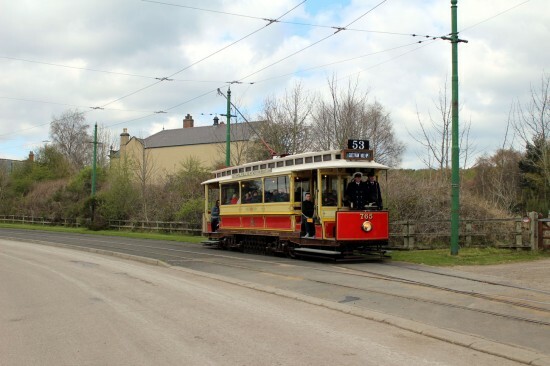 It was also possible, at times, to get more than one tram together as they were often seen queuing waiting as visitors got on and off trams – a task which seems to take a very long time on occasions, if ever there was an example of one of the reasons trams were abandoned the speed of boarding at Beamish must be one! Pockerley in particular was somewhere that it was not uncommon to see two or three trams with the next tram not able to access the token the bank here until the previous one had left the Entrance (in the morning)/Exit (in the afternoon!) stop. Away from the trams are there was so much more to see transport wise. There were no fewer than six different railways in operation including three down at the Colliery. This included the very first use of a new 15” gauge railway which saw River Irt and Katie from the Ravenglass and Eskdale Railway top and tailing passenger services. Other passenger rides were possible on the Rowley Railway (with Peckett 2000 in charge), the Beamish Cog Railway and the Pockerley Waggonway (Puffing Billy in service). 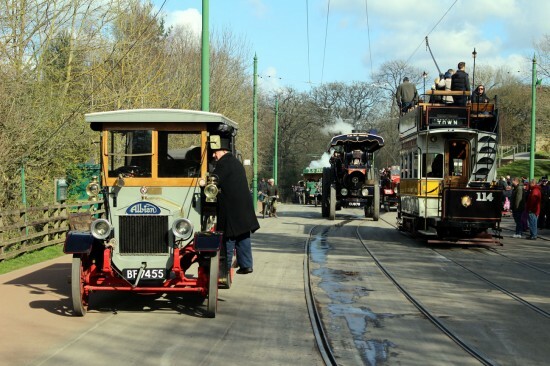 But it was the roads around the museum that the main action was to be seen with so many different vintage vehicles in operation – from pedal power, to steam power to petrol and diesel power. There is not enough room here to mention all of them but this included several buses – and Charabanc – lorries, cars and early Fire Engines. One of the big stories of the weekend was that one of these Fire Engines had even appeared in the recent live action remake of Dumbo – and just in case you didn’t realise it had a large cuddly toy elephant on the front! There are probably many other vehicles which caught the eye of visitors but there were so many it isn’t possible to mention them all and this isn’t really the place! 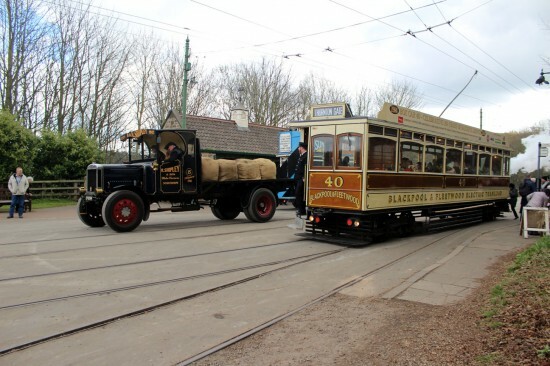 And if all the large scale transport action wasn’t enough to keep you entertained the Saturday and Sunday of the event saw a Model Tramway Exhibition taking place with several tram layouts in action including one of the Beamish Tramway itself! All in all it was a very busy and excellent event once again at Beamish and there must have been enough going on to keep even the most critical transport enthusiast happy for most of the time. There may be a few minor gripes from visitors about how busy it does get with long queues in evidence for a lot of the day but that aside it is an event which can be highly recommended for the future whether your interest is just in trams or if you are also keen on other forms of old transport. * A full collection of photos will be added to a future update of British Trams Online. All being well this should be this coming weekend but I do have a fair few photos to go through first! On 12th April Manchester 765 is seen in the Town as passengers alight just as a vintage Fire Engine – complete with fire crew! – passes. 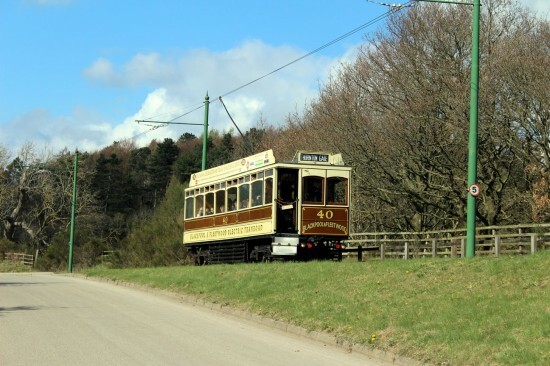 Also taken on 12th April we see the other visiting tram, Blackpool & Fleetwood 40, heading between the Town and Pockerley with another clockwise circuit. A busy scene at Pockerley as Newcastle 114 is about to depart for the Entrance just as Fowler Road Locomotive Providence arrives and a car pulls out of the Waggonway Yard. 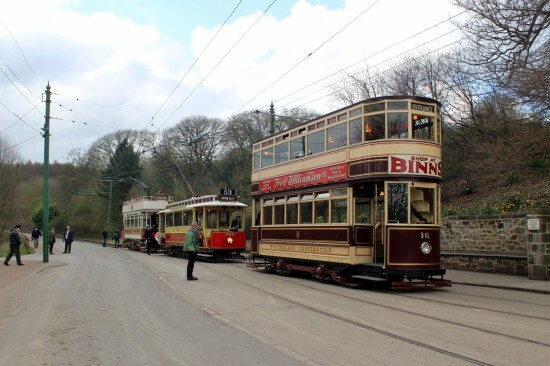 Moving onto 13th April and trams start to enter service with three of the five trams for the day seen here outside the depot: Sunderland 16, Manchester 765 and Blackpool 31. Manchester 765 departs from the Town with another circuit of the tramway. Blackpool 31 was in service on 13th April and is seen here with passengers well wrapped up against the elements as it approaches Pockerley. 40 at Foulbridge just as a Leyland lorry heads past. Five trams were all running together on the Saturday so it does happen, especially when they are busy. Apparently there were 23,039 visitors over the four days which shows just how busy it was! Oh yes I see where it says that in the article now! 765 had a problem Sunday first thing. I know because the search for the MTMS engineer involved checking if he was in the Exhibition. Turned out he was driving 114 on the far side of the circuit! He fixed it but it was decided against doing a change over.